As every angler knows there are definite 'seasons' for particular fish. Some are most active in winter and others in summer. As a rule the species with a more northerly distribution feed best in cooler water and vice verse. However, it is a good deal more subtle than this. Each species tends to 'switch on' (or off) to particular foods at certain times. There are well known 'triggers' such as the peeling of shore crabs in the spring (timing differs in different parts of the country) and so on. Related to these changes in food type are changes in the feeding behaviour of the fish. 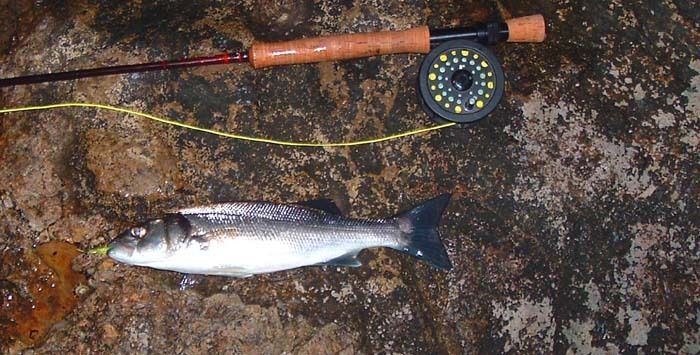 For example there is no doubt that surface and near surface feeding of bass is most obvious in Summer and Autumn. Of course when particular types of prey are really abundant many species of fish may join in the feast. Seaweed maggots, Idotea lice, sandeels, sprats, squids, fry, prawns, shrimps, spawning ragworms, migrating lugworms, peeling crabs, etc., etc. all have their moments. This spring I've been trying to find out when the fish were really worth fishing for with small, fishy looking, flys that resemble the young of various species. Most sea fish spawn in late winter and early spring so their young are about in large numbers in spring and early summer. I started in March and since then have certainly been catching fish on my 'flies' (as you know I also use little rubber lures and strips of fish), mostly in small numbers. Of course I could have gone to places such as around Poole Harbour or he Fleet where school bass congregate and caught lots of fish but I am talking about open shore fishing for bass, mackerel, pollack, coalfish, garfish, scad and the like. It is not simply a matter of fish being in the area. When you are fishing from the shore not only do the fish have to be actively feeding but they have to be within range. 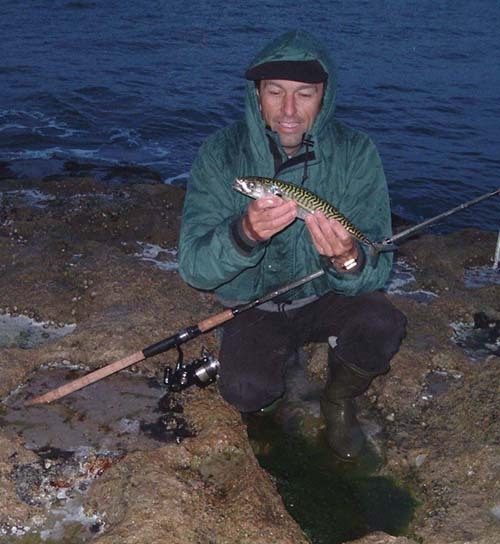 For months I have been able to catch lots of mackerel on a spoon cast seventy or eighty metres but rarely did they come within range of my fly gear. In fact it was mid June before the fish became relatively easy to tempt on the fly. 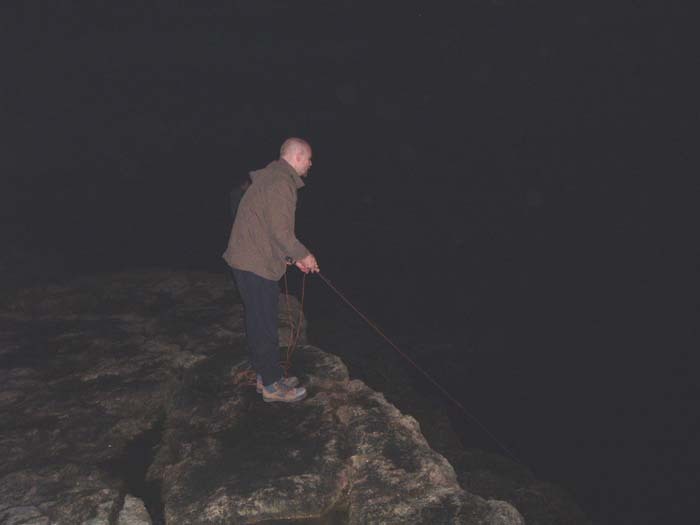 Even then it was necessary to fish at the right times of day. After catching a reasonable pollack on the fly I waited a couple of days before having another go. This time the fish were there as soon as I arrived and I began to catch pollack straight away. In the next hour I had four pollack, four mackerel and four school bass (all returned) - then the fish 'switched off'. The following day I went down again - with Brian and Steve - and we more or less repeated the procedure. 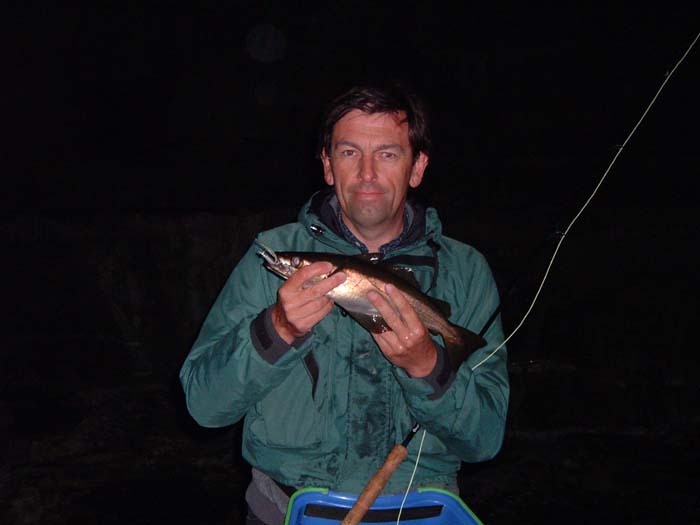 There were three of us so we were able to fish with different methods at the same time and although we caught quite a few fish on the fly gear it was still easier to catch mackerel on a small spoon. The fish were all feeding on tiny sprats or herrings and no doubt a lure closely resembling these prey fish is the best thing to use.